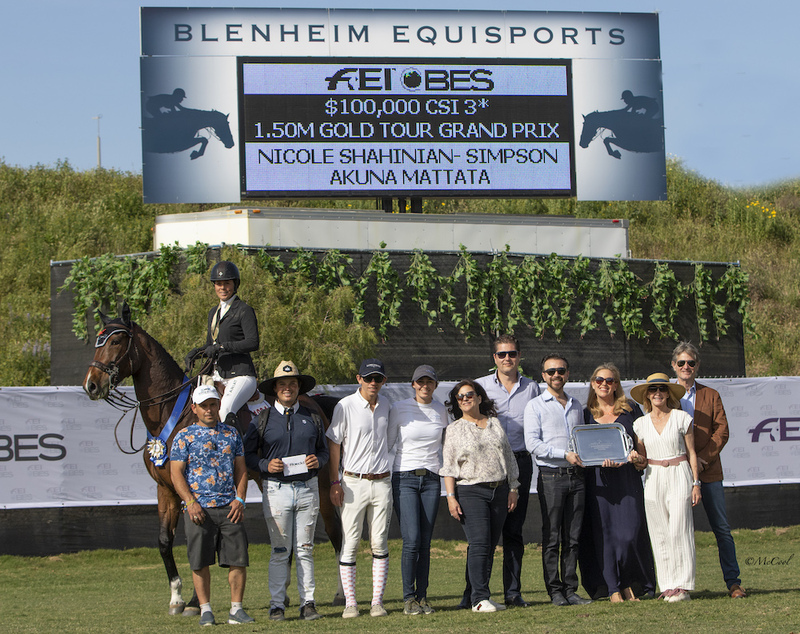 San Juan Capistrano, CA – Competitors brought their A-game on Sunday afternoon for the final leg of the FEI CSI3* Gold Tour. A sizeable crowd filled the hillside cabanas, the Riders’ Lounge and the grandstands at the Blenheim EquiSports Derby Field. The challenging course and top competition did not disappoint! 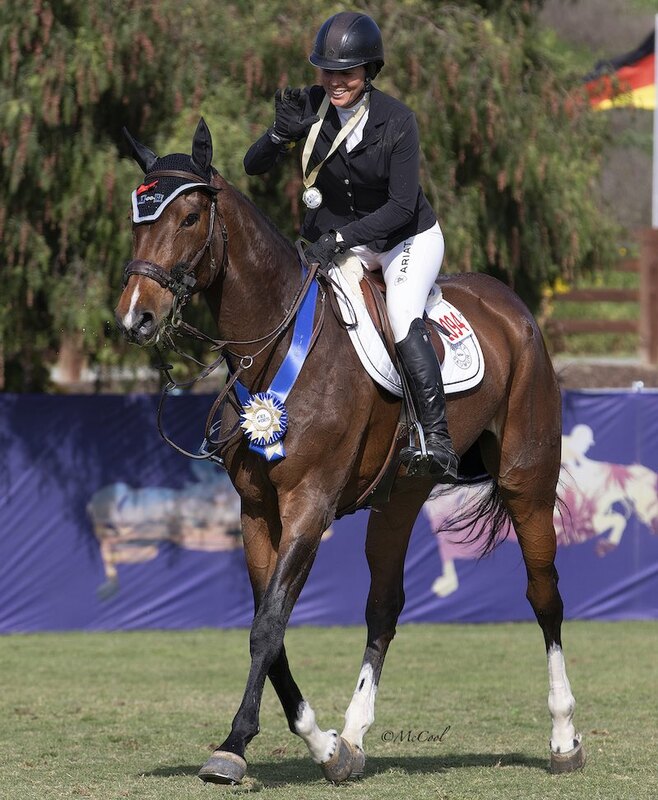 With a jump-off of seven, it was last to go Nicole Shahinian-Simpson and Silver Raven Farms’ 11-year-old Holsteiner mare, Akuna Mattata, who topped the field in the $100,000 1.50m Gold Tour Grand Prix. Twenty-seven competitors tested the track, created by Leopoldo Palacios, which included two liverpools, a line with an open water jump to a combination, and a final line away from the in-gate with five elements – an oxer to a triple combination to an oxer with yellow planks.That final test kept eleven competitors from returning to the jump-off round..
First to ride without fault wasn’t until ninth in the order, Cassio Rivetti (BRA) and Neil Jones Equestrian’s Kaiser Van Het Lambroeck. Six more riders representing four countries, Mariano Maggi (SWE), Rich Fellers (USA), Shawn Casady (USA), Taylor Siebel (USA), Uma O’Neill (NZL), and Shahinian-Simpson (USA), joined the Brazilian in the jump-off. Rivetti was the first to ride against the clock setting the bar high going clear in a time of 39.69 seconds. A tough time to beat, the following five competitors weren’t able to go as fast and leave all the fences up. With the enviable position of last to go, Shahinian-Simpson and Akuna Mattata, a pair known for their fast footspeed, came in blazing. The pair’s tidy turns and fast pace carried them through the timers one second faster in 38.71 to seal their victory. Along with the glory, prize money and awards, Shahinian-Simpson is now also a strong contender to win the The Gold Tour Leading Rider Award. Shahinian-Simpson’s win puts her in the second spot in the standings, just behind Rivetti. Earning second place in two of the three classes this week boosted Rivetti to the top. 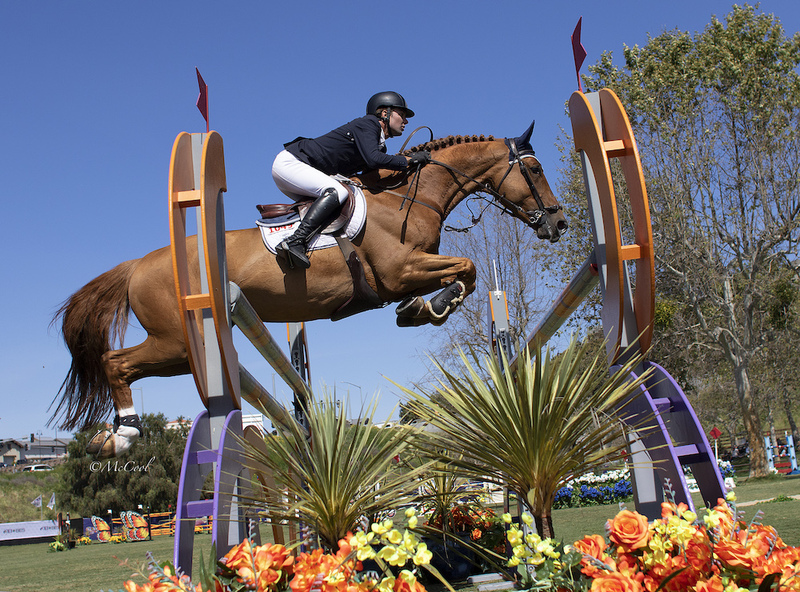 Generously sponsored by Club Hípico La Silla, the rider with the most money won in the six Gold Tour classes at the Blenheim Spring Classic II CSI3* and the Showpark Ranch & Coast CSI2* will be given a chance to experience FEI competition in beautiful Monterrey, Mexico, this fall. 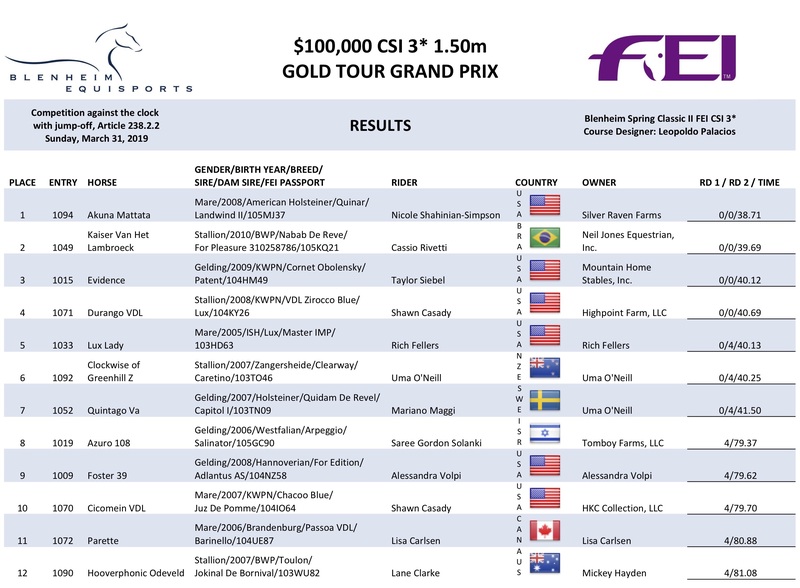 The afternoon’s competition concluded the FEI CSI3* Tours for the Blenheim Spring Classic 2. 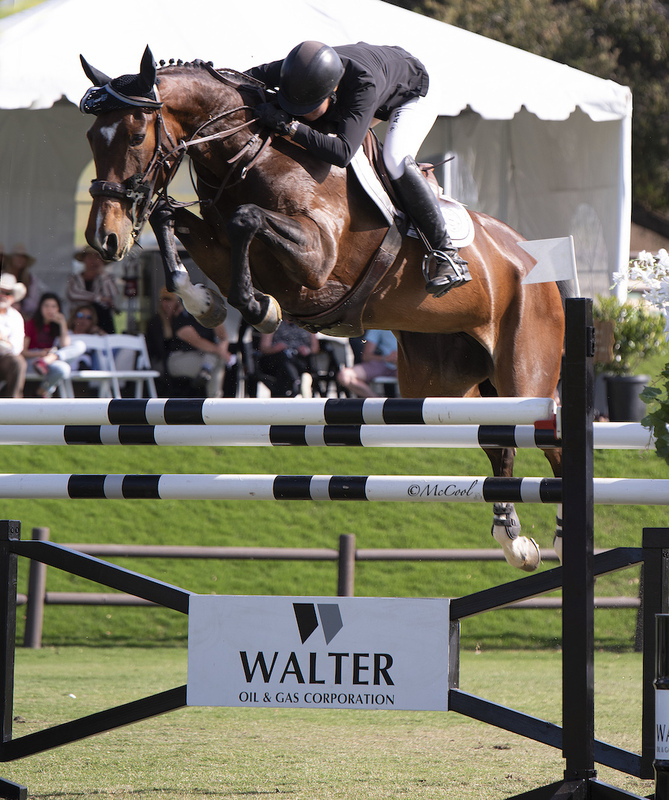 Next week Spring Classic 3 will feature a Markel Jumper Classic, a Blenheim EquiSports U25 Classic, a USHJA International Hunter Derby, and a $50,000 1.50m Grand Prix, presented by EQU Lifestyle Boutique.